Startups are thrilling. It’s hard to beat the excitement of launching an innovative new venture. The excitement is palpable, and it leads to a kind of euphoria in the venture’s culture. But too often that initial euphoria descends into culture deflation, like the air leaking out of a tire. First it slows you down. Eventually it brings you to a stop. The magic disappears. We’ve seen it in startups, and it ain’t pretty. Though a strong organizational culture is critical in startups, it is a blind spot for most entrepreneurs. Many founders take culture for granted, letting it emerge and evolve haphazardly. They dive into the day-to-day struggles of venture-building and putting out fires. Meanwhile, they don’t notice as the culture slowly fades into a pale shadow of what it once was. Eventually, the venture starts bleeding talent and spiraling downward. How to avoid that sorry fate? * First, clarify the ultimate aims of the venture. Decide what it’s really all about. Is the startup “built to last” or “built to flip”? What is it that you most want to achieve with the venture? Why are you doing it? What impact do you most want to have, and on whom? It helps to write out the venture’s purpose (often called “mission”), values (to guide the behavior you desire), and vision. Once you are clear on those ultimate aims, bake them into the venture’s culture, processes, daily decisions, business plans, and even performance reviews. * Second, maintain “flexible consistency” in pursuing those ultimate aims. Sound paradoxical? You bet. Let’s break it down. To begin with, startups must be flexible to survive. Very few see their initial plans come to fruition. Most must make significant “pivots”—changes in direction in response to market feedback, competitive actions, and technology disruptions–to avoid insolvency. Plan A rapidly morphs into Plan B, C, and D until eventually a workable strategy and sustainable business model emerge. While flexibility is needed in the means for achieving the ultimate aims, the aims themselves, by contrast, require fierce dedication—even in the face of adversity. Consistency in aims with flexibility for how to achieve them. * Third, probe for fundamental stakeholder fit–finding people to work and partner with who are aligned with and passionate about your ultimate aims. Probe everybody: potential co-founders, board members, investors, employees, vendors, and even customers. Remember that when hiring new employees, it’s not just about talent and track record. Look also for fit with the desired culture (as well as character and emotional intelligence). When negotiating with investors and vendors, recall that it’s not just about the money. You need good and committed partners who share your values and vision. Too many entrepreneurs move at warp speed on hiring and partnering, with minimal vetting. They come to regret it later with the delays, disruptions, heartaches, and expenses associated with fixing bad matches. Thankfully, there are many examples of ventures that have built a strong culture even as they blasted through the challenges of launching a new venture. Think Patagonia, Clif Bar, DreamWorks, Southwest Airlines, and Zappos. They interview not just for relevant experience and technical ability but also for cultural fit—including things like humility, fun, and weirdness. All employees help shape the culture: they write missives each year about what the culture really is and means to them. All of it is assembled into Zappos’s living and breathing Culture Book. A strong culture is essential in startups, as it is in all other enterprises. Entrepreneurs neglect it at their peril. 1. How strong is the culture in your organization? 2. How purposeful and systematic are people about building and maintaining your culture? 3. What more can you do to make a difference in building the culture you desire? 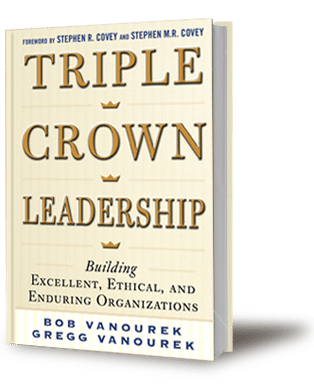 Bob and Gregg Vanourek are the authors of Triple Crown Leadership: Building Excellent, Ethical, and Enduring Organizations (McGraw-Hill, 2012).